The soundtrack for this comic. The only beat-em-up arcade machine I’ve beaten, I believe, is the Simpsons one. The furthest I’ve gotten on the X-Men one was the end Magneto fight, the real Magneto. This entry was posted on Wednesday, February 22nd, 2012 at 12:00 am and is filed under Comics. You can follow any responses to this entry through the RSS 2.0 feed. Both comments and pings are currently closed. STAY OUTTA MY SHED, OKAY? I think she said we’re always welcome in her shed. Applejack if you eat all those apples you’re gonna get a wicked bad tummyache. 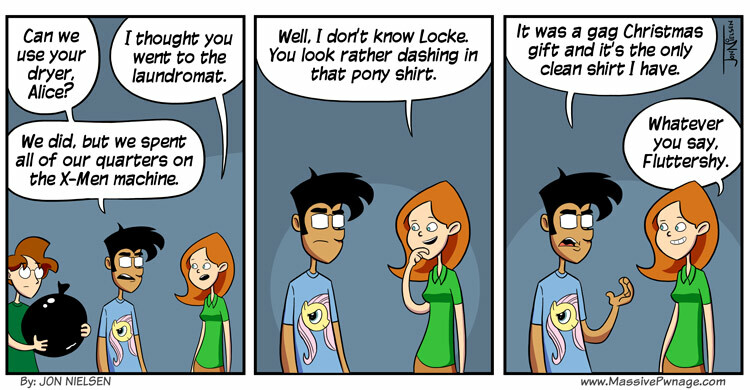 Everyone knows Locke secretly adores ponies. was the dashing part supposed to be a pun? uh lockie we all know you broniyed a few hundered comics ago. Locke…way2cool shirt…May I borrow it sometime?? The only way it would be better would be if that was Pinkie Pie. When you guys first linked to ponies back in August I decided to watch the first episode with my friend, we thought you were trolling us. Now I’m a brony and proud of it. You did this to me, thank you so much. Ponies! I love you guys so much. Brony Panel at KitsuneKon was beast.